Decision time: More talks in 2015? The decision will be taken by consensus when nations adopt the final report of the CCW’s 2014 annual meeting on the afternoon of Friday, 14 November following a week of deliberations. Poland’s Ambassador Remiguez A. Henczel is serving as president of the meeting, taking over from Ambassador Jean-Hugues Simon-Michel of France. The Campaign to Stop Killer Robots urges support for a renewed CCW mandate to continue and to expand the deliberations in both duration and substance in 2015. It also calls for any CCW process to be more inclusive of women after the first four-day meeting held in May 2014 featured an all-male line-up of 18 expert presenters. On Thursday, 13 November, campaign representatives will hold a media briefing for UN-accredited members of the Association des Correspondents Aupres des Nations Unies (ACANU) at 11:00am in the Press Library, then hold a side event briefing for CCW delegates at 2:00pm [note new time] in Room XXIV. The Secretary-General of Pax Christi International will announce a new interfaith initiative against fully autonomous weapons. See the campaign’s delegation list for the CCW meeting. 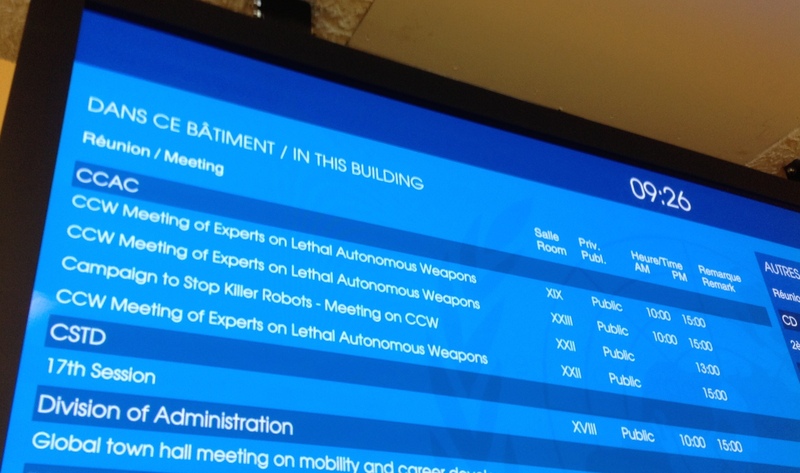 More than two dozen states and several groups of states expressed explicit support for continued CCW deliberations on killer robots during the UN General Assembly First Committee last month. Ecuador and Pakistan reiterated their support for the call to ban the weapons, while the United States said “it is still too early to determine where these discussions might or should lead” but welcomed additional discussions. A resolution introduced by France that “notes with satisfaction” the 2013 decision to begin talks on killer robots passed the First Committee by consensus on 30 October. The campaign calls on all states to participate in the international deliberations on fully autonomous weapons, and develop and articulate national policies in consultation with relevant civil society actors. Nations should implement the recommendations on autonomous weapons contained in the 2013 and 2014 reports to the Human Rights Council by the UN Special Rapporteur on extrajudicial, summary or arbitrary executions, including his call for a moratorium on fully autonomous weapons until new international law is achieved.